Nothing says comfort food quite like a pasta dish! The only way it could be better is by adding bacon! Pair that with other local flavors, and you’re sure to hit a home run with this meal! Cook bacon until crisp. Drain on paper towels, chop into bite sized pieces and set aside. Using a tablespoon of bacon fat, cook diced onions until tender and translucent. Add garlic and oregano. Cook for a few minutes. Add tomatoes, sauce, salt and pepper, and continue to cook for 10 minutes. Add bacon and chopped basil. Let simmer while you cook the ravioli. Form a mound with the flours and salt. Make a well in the center of the mound. Add the eggs, egg yolks and oil into the well. Using a fork, mix the dry and liquid ingredients by dragging the dry ingredients into the center. Keep doing this until you have formed a sticky dough ball. Add water as needed. The dough should have a soft texture. On a floured surface, knead the dough ball by pushing down with the heel of your hand then give the dough a quarter turn. Repeat this until the dough is smooth, elastic, even in color and no longer sticky. Set the dough aside to rest for 15-30 minutes, or wrap in cellophane and chill until ready to use. Quarter the dough. Run 1/4 dough through a dough machine as directed in the instruction manual. Roll out pasta sheets to make raviolis. Fill the raviolis and cook in boiling salt water. Add to sauce. Pour the milk and cream into a stainless steel pot. Stir in the salt. Bring to a full boil over medium heat, stirring occasionally. Turn off the heat and stir in the vinegar. Allow the mixture to stand for 1 minute until it curdles. It will separate into thick parts. Pour the mixture into the cheesecloth-lined sieve and allow it to drain into the bowl at room temperature for 20 to 25 minutes, occasionally discarding the liquid that collects in the bowl. The longer you let the mixture drain, the thicker the ricotta. Mix all together and fill the ravioli shells. Cook in boiling salt water for 6-8 minutes. Drain. Add the sauce and ravioli together and serve in a large bowl with more fresh basil and grate parmesan cheese on top. When do we get to use the homemade ricotta?? 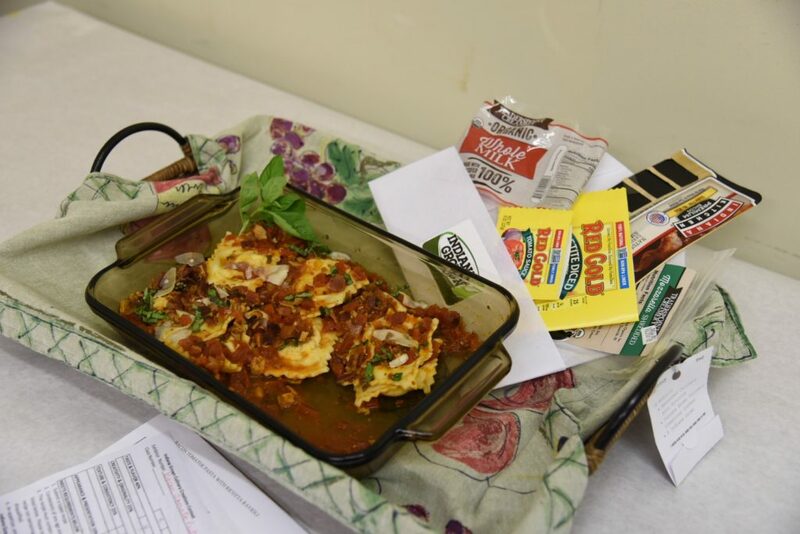 Sorry if the order of the recipe is confusing, but you will use the homemade ricotta filling to fill the raviolis. Hope that helps!